Olive drab? How about olive FAB? This gorgeous Olive Gabardine is calling your name, just waiting for the moment when it will be placed upon your sewing table, ready to be transformed into your next great creation! Gabardine is remarkably adaptable. 100% polyester, it is durable and strong with a tight, diagonal weave that lends a fabulous aesthetic appeal to the finished product. Although there are many uses for Gabardine, the most common include suits, trousers, windbreakers, overcoats, and work uniforms. And with a deep, rich shade like this beautiful olive, it will be easy for you to add onto that list whatever suits your fancy! This color pairs amazingly well with a more classic gray, adding a hint of color to offset an otherwise monotone palette. I'm making a outfit to match my shoes. Looking for a suitable fabric in the right color for an Imperial Officer's uniform from the original Star Wars movies. creating a Imperial officer uniform for the 501st. Good fabric for a vest. I needed something with a similar drape to linen (as linen is too expensive) and a specific green color for a long tunic I'm making for a costume. I ordered a sample a few months ago and this was what I had in mind. Again, a current color choice for the fall/winter season. I like the color and the fabric. I used to wear this fabric long time ago and it was a great fabric at that time. At that time I was in England. I chose this fabric due to the particular shade of green and that it matches well with my current decor. To make an Imperial Officer Uniform from Star Wars for twin grandsons! We need this for some army patches. I chose this fabric because it is 100 percent polyester. would this fabric be good for patches? I am recovering dining chairs and love this color. Would this be a suitable material? BEST ANSWER: While it's typically used for apparel, it is a durable fabric and would likely work. We recommend ordering a sample to be sure that it will work for your project. Would this material work to add inches to a green sherrif trouser ? BEST ANSWER: We don't see why not but you'd have to match the fabric first. Hi, Would it be a good material for a beanbag chair? is it heavy and does it wrinkle easily? BEST ANSWER: This apparel fabric would not be suitable for a bean bag chair. Something like cotton duck, denim, or twill would be more durable. You think this fabric will be good to make cargo pants out of? Why so many olive green colours? What are the cleaning instructions? Would it be machine washable? I would like to make drapes out of a machine washable material and this is the only when I can find in his collar. Thank you! Nice material, great service from you in getting the material. The material is great, however, I have not made anything from it yet, as what I needed it for was to match an Army uniform which was not the right green. It was the old pine green I needed. I will eventually find use for the olive green material. What more could I have asked for?! This material is stunning!! I used it to cut a cloak and it was perfect! Warm and a good weight made it just what I needed! The weave was expert and I could bare see through the material at all, which was a huge plus for me since it meant the cloak would be on the warmer side! I have some left over and I’m going to be using it for a pillow and maybe even a skirt because it’s so versatile ! Excellent quality beautiful color. 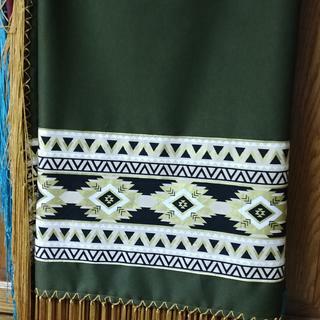 I make traditional Native American dance shawls. This fabric is perfect.